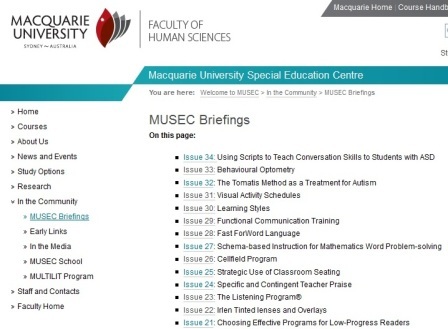 The Macquarie University Special Education Centre produced a series of one-page briefings on a range of special education topics, as part of the University’s community outreach program. They were designed to inform special educators and other professionals about the evidence base for a variety of educational practices. Update December 2018: They are no longer available on the Macquarie University site but before they were removed I obtained permission from MUSEC staff to make them available from my website provided no changes were made to them. Get them here. The desperate parents of struggling readers can sometimes be encouraged to spend loads of money on things that are marketed as miracle cures but in fact don’t have much or any evidence base. These Briefings can thus provide a handy reality check on a range of topics, for parents as well as professionals. I’ve asked MUSEC to write a Briefing about Cogmed, which seems to be increasing in popularity (update December 2013: they’ve done it! Click here to read it). Perhaps if you know of other methodologies that are being promoted, and would like to understand their evidence base, you’d also like to put in a request. This might not be a MUSEC priority, but it doesn’t hurt to ask. Even though the MUSEC Briefing on Fast ForWord Language does not recommend it, there is some evidence that this computer program does have some value for students with receptive language disorders/delays, so I still do recommend it for some learners. You can read a bit more about Fast ForWord in this article from The Age in 2007 – for more than a decade I’ve been the Speech Pathologist at Debney Park Secondary College (now called Mount Alexander SC), and I first recommended Fast ForWord for one of our students after finding out about a small study done at the Royal Children’s Hospital which, as the article says, found that, “children with auditory processing problems made two to three-year gains on standardised tests after two to three months”. At this school, we still use Fast ForWord with teenagers with poor receptive language, and have found that their listening test scores have tended to improve significantly, and that they have consistently reported being able to listen more effectively in class after doing Fast ForWord. Because we buy a site licence, we keep the per-student cost of this program low. However, our experience is only anecdotal, not a proper study, and MUSEC is right to warn people about the broadscale use of Fast ForWord with learners with a range of literacy and language difficulties. It’s a relatively expensive program, and there has not been enough proper research to support the extravagant claims sometimes made about its effectiveness. So if you are considering it, please seek the advice of a professional who’s not selling it first. Update December 2018: The MUSEC Briefings are now archived here. This entry was posted in curricula, research, teaching strategies, theory on March 15, 2013 by alison. Thanks so much for your amazing website and information. My son is in year 2 and has a borderline APD diagnosis. He is on a D for English, but gets an A for effort. We did reading eggs and half of the Nessy program recommended by Speld but I am not seeing big improvements. Do you think it would be worth trying Fast Forword in his case? I have been looking through links to the MUSEC Briefings above and don’t seem to be getting very far other than the MUSEC School page. Is this right? I’m wondering if your links have changed in the background, or if I am simply not following the right path. Sorry, I didn’t realise people would still be reading this 2013 blog post, so didn’t add the link to the archive of briefings to this page till now.